Gardens of Light, which is Montreal's depiction of one of Imperial China's most beautiful ancient traditions resembles the Lantern Festival in many ways. But it's not held on the 15th day of the Chinese New Year. Instead, the Montreal Botanical Garden's annual Gardens of Light event coincides with one of China's other favorite festivals: the ​Moon Festival, a harvest season celebration also observed in Taiwan, Vietnam, Singapore, Malaysia, and other Asian nations. The Moon Festival is a joyous celebration that features filled mooncakes wrapped in pretty boxes and often gifted to show appreciation to others. Public parks are lighted with special displays and lanterns. Ancestors, as well as the Moon Goddess, are honored by burning incense at the temple. Colorful lanterns are hung high on poles and then launched into the sky. Montreal's Gardens of Light mimics the spirit of these festivals in many ways. Each fall, the gardens become a magical show of lights. The event, having grown to become one of the leading fall season attractions in Montreal, appeals to everyone. The easiest way to get to the Montreal Botanical Gardens from central Montreal is by subway. In central Montreal, you can board at McGill station, ride to the Pie IX station, and walk a short distance to the gardens. You can also travel by private car, bus, taxi, or rideshare. It's less than a four-mile trip. There is a charge for parking but there is also free neighborhood parking if spots are available. 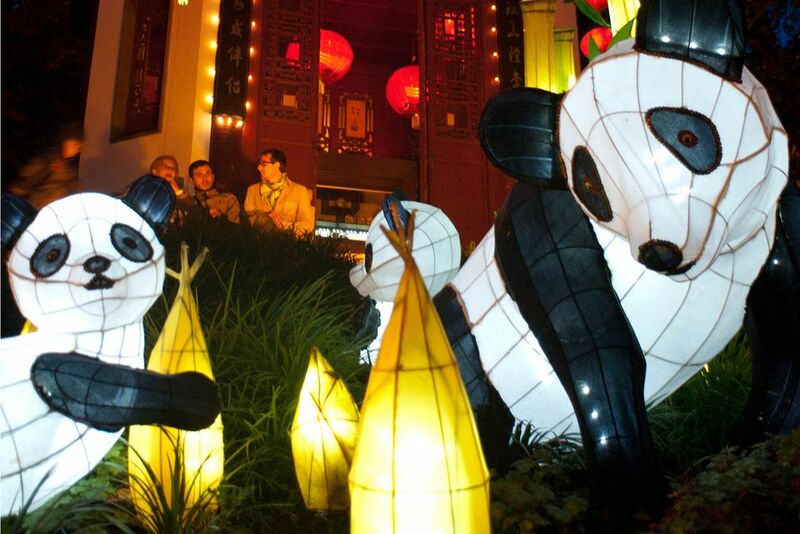 Someone who has been to China might notice that Montreal's Gardens of Light lanterns bear an uncanny resemblance to typical Chinese Moon Festival lanterns. That's because they are one and the same. Shanghai is one of Montreal's sister cities and is an essential partner in making the Gardens of Light possible. The lanterns are constructed in Shanghai based on the theme and designs of Montreal Botanical Garden artistic designer My Quynh Duong. Once built in Shanghai, they're shipped to Canada where it takes a team of local assemblers roughly two months to prepare and mount anywhere from 900 to 1,000 lanterns on garden grounds. About 200 of those lanterns are newly crafted every year. The intricately constructed lanterns, in the shape of animals, birds, vehicles and even people, are the draw. Each year, a theme is chosen by garden designers. Ideas are sent to Shanghai for new lanterns and then sent back to Montreal to be put together and installed by garden designers. The variety will intrigue you. Imagine large Chinese dragons, people riding bikes, horses, pandas, and fish. Sometimes the designers put together a large, impressive exhibit such as a display of the Forbidden City surrounded by a pond. For 19 years, this annual attraction was called Magic of Lanterns or La Magie des Lanternes. In 2012, just in time for the event's 20th anniversary, the name was changed to "Gardens of Light," marking the addition of the Japanese Garden to the fold. Previously, only the Chinese Garden and its multitude of lanterns were featured. The Japanese Garden does not have any lanterns, but instead, it lights things up with a multicolored lighting scheme that brings the darkened garden to life after the sun sets. It's a different concept, a more subtle and subdued set-up compared to the lanterns, but it adds a touch of peaceful beauty to the overall experience. In addition, the First Nations Garden is lighted during the festival. The gardens are part of a large complex of interesting attractions. Nearby, you'll find the Space for Life Museum, Montreal Insectarium, the Olympic Park, and the Montreal Planetarium. And by day, wander the Montreal Botanical Gardens' collection of 22,000 plant species, 10 exhibition greenhouses, and sculpture gardens, all found in more than 20 thematic gardens. Gardens of Light is a top Montreal attraction. Consequently, it can get crowded in the Chinese and Japanese Gardens. If you go on a weekend and wait until the last week of the event to attend, you can be guaranteed that the event will be crowded. To avoid crowds, plan your lantern outing on a weekday evening at dusk. Why dusk? It's interesting to see how the lanterns and the Chinese garden itself change in appearance as the sun sets. It offers a contrasting perspective that you won't otherwise experience. And do consider dropping by when it rains. The masses generally stay home, rendering the experience all the more idyllic. Bring an umbrella, waterproof shoes, and you'll be treated to the colorful lights reflecting in the puddles and raindrops. Admission fees vary and there are special pricing options and group rates available. Consult the garden's hours of operation and event schedule when you are planning your visit.